Created in the year before his winter death behind his home at the edge of the White Mountains in Rumney, New Hampshire, the retired master teacher was sculpting for his own pleasure. His granddaughter fondly remembers him standing outdoors in the good weather applying clay to the chicken wire armature he had built on a stand. A sculpture in the round from his imagination was coming into being, a mythological winged horse that sprang from the blood sinking into the earth from the severed head of Medusa. The creature breathes in life through its flared nostrils and open mouth and, with eyes wide, crouches from its hindquarters, one front leg bent, one braced, head and ears back, eager to take its first flight in its powerful new body. Pegasus has come alive! Stylistically, this Pegasus is different from the sleek refined yet lively version of his Harvard Advocate Medallion from thirty years before. Gone is the formality of the requirements for good medallic art, gone is the mythological quality of the magnificent winged creature and gone is the flat format of art meant to be hung on a wall. Here is a breathing quivering tangible animal. You can almost feel the texture of the rough coat of hair on the body and the form of the muscles tense beneath the skin. The hair of the fetlocks hangs thickly over the hoof and the thick bushy tail curls sensuously behind him as it falls on the ground. The wings are stylized, overlapping and smooth. They look as if they are still unfurling at the tip of the “fingers, ” and the curve of the end of the uppermost and longest feathers echoes the shortest rounded feathers of the upper “arm” between the elbow and the shoulder. Compositionally, the form is rectangular with the topmost edge of the wing parallel to the base. The wings are parallel to each other, ready to spread in flight and the hind legs are firmly planted at the width of the hips prepared to spring, thrusting the movement forward and upward along the angle of the body. The weight is almost all back on the hindquarters with the front legs already lifting off the ground and the head, neck and shoulders pulling the weight back from them. The head is pointed straight forward with the bridge of the nose in line with the top edge of the wings There are no twists in the body. Details create color in the surface texture of the hair coat, the short shorn mane, wrinkles in the skin below the jaw and bushy undulating tail. Asymmetry is created only in the front legs where the action is about to happen. The movement is clearly moving upward and outward, the mass of the wings and hindquarters balanced by the vibrating space that exists between the front hoof and the extended line of the box formed by the top, back and base of the whole. 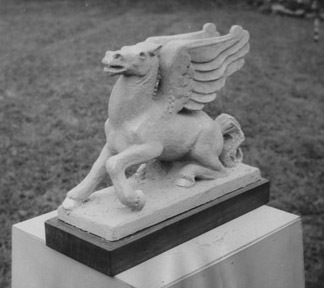 Animal sculpture was clearly a part of Allen’s repertoire. His wife Agnes relates, “When about 15, he tried cutting a head in fieldstone – later got a chunk of marble and cut a horse’s head which thrilled him so he began to have visions of working as a hack sculptor for others.” While working as a studio assistant to Bela Pratt, he was responsible for sculpting the horses on two of Pratt’s monuments, the Lord Jeffrey Amherst and the Polo Pony. He studied animals as part of his anatomical training and taught animal sculpture to his students. One summer the Museum School catalog lists a trip to Franklin Park Zoo to observe and sketch them as part of Allen’s class. The School archives show an image of Allen instructing a student working on a sculpture of a horse. Allen personally loved animals and took a great interest in wildlife and the family pets. His work includes several animals, not only the large horse figures for Pratt, but also a carved horse’s head, three eagles, two elephants, two flying horses, three frogs, small birds, a wolf, a pony, a turtle, a fish, a duck and a dolphin. Animals have always been part of sculpture. Allen was well schooled in their anatomy and took pleasure in portraying them. This Pegasus may be his last work. Owned for a while by Allen’s grandson Eric. Broken when in his possession. Repaired, recast and transferred to another family member.